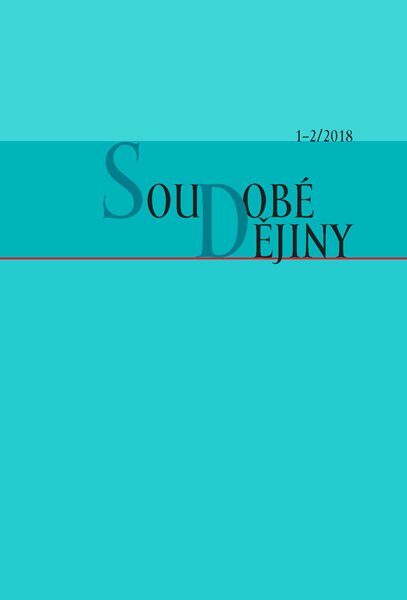 Soudobé dějiny 1–2 / 2018 - Ústav pro soudobé dějiny AV ČR, v.v.i. The author summarizes the life and in particular scientific career of historian Bedřich Loewenstein, describes areas of his professional interest and his intellectual orientation, reminds of his most important works published in Czech and German, and assesses his contribution. Loewenstein was born in 1929 in Prague, in a Czech-German-Jewish family, lived through the German occupation in difficult conditions, and started studying history and philosophy at what was then the Faculty of Arts and History of the Charles University, but was expelled two years later for political reasons. He was allowed to complete his studies later, and in 1957 started working at the Institute of History of the Czechoslovak Academy of Sciences, where he remained until his dismissal in 1970. He started intensive contacts with West German historians and other intellectuals during the 1960s, and organized an important international symposium, “Europe and Fascism”, in Prague in 1969. Since the early 1970s, he was not allowed to publish and was employed as an interpreter/translator of the trade mission (since 1973 embassy) of the Federal Republic of Germany. Although watched by the State Security, he managed to make use of his position to establish an important connection between domestic dissenters and their supporters abroad, which was used to exchange publications and other documents. In 1979, he accepted an offer of professorship of recent history at the Free University in West Berlin, where he remained until 1994 and where he could develop and expand his research interests and devote himself to intensive publication activities. For a long time, Bedřich Loewenstein was focusing on the German history of the 19th and 20th centuries; since the 1960s, he was also studying ideological, psychological, and social prerequisites of Nazism and later also more general issues of crises of the 20th century, modernism and modernity, civic society, European nationalism, and civilization. In this respect, he was able to integrate approaches and knowledge of other social sciences – sociology, social psychology, anthropology, philosophy, political science, and economy – in a prolific manner. He was a long-time and intensive intermediary of views and ideas between the Czech (or Czechoslovak) and German historiographies. His works, written in a concise, scientific-essayist style, earned him respect among colleagues both at home and abroad. His principal works include Plädoyer für die Zivilisation (Hamburg, Hoffmann und Campe 1973), Entwurf der Moderne: Vom Geist der bürgerlichen Gesellschaft und Zivilisation (Essen, Reimar Hobbing 1987; in Czech in 1995), Problemfelder der Moderne: Elemente der politischen Kultur (Darmstadt, Wissenschaftliche Buchgesellschaft 1990), My a ti druzí: Dějiny, psychologie, antropologie (We and the others: History, psychology, anthropology) (Brno, Doplněk 1997; in German in 2003). A synthesis of Loewensteinʼs thinking about a broad spectrum of issues is presented in his book Der Fortschrittsglaube: Geschichte einer europäischen Idee (Göttingen, Vandenhoeck & Ruprecht 2008; in Czech: Víra v pokrok: Dějiny jedné evropské ideje. Prague, OIKOYMENH 2009). The conversation between Bedřich Loewenstein and historian Kateřina Čapková, who prepared it for publication, took place in July 2013 in Berlin. In the interview, Loewenstein is talking about his Czech-German-Jewish family roots, recalls his difficult childhood with his mother in the German-occupied Prague, wartime emigration of his father and brothers, or studies at the Faculty of Arts and History of the Charles University and the conflict resulting in his expulsion, his work at the Institute of History of the Czechoslovak Academy of Sciences and his dismissal in the early 1970s, his employment at the Embassy of the Federal Republic of Germany, which he made use of to facilitate transfers of sensitive documents between local dissidents and Czechoslovak exiles. He also touches upon his intellectual inspirations at the time when he was a teenager, or the morally questionable behavior of some of his colleagues among Czech historians. 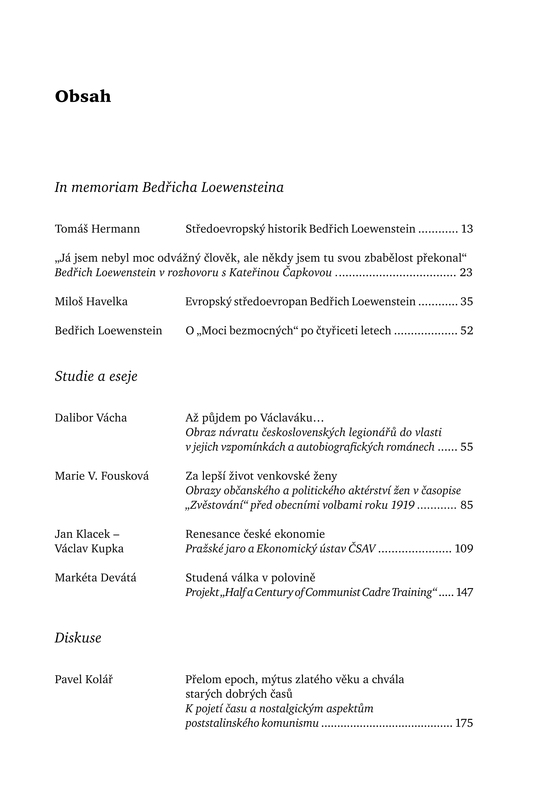 In his article, the author presents, in a concise and condensed fashion, the foundation, contours, principal features, and themes of the thinking of Bedřich Loewenstein (1929–2017), a modern and contemporary history historian spanning a multitude of disciplines. He finds the deepest layer of Loewensteinʼs thinking in historical anthropology, in his interest in specific human beings and their actions, motivations, and orientations, explaining the historianʼs “frame of mind” by his personal, lived experience of a Central European intellectual confronted with dramatic turns of history in the twentieth century. This also the reason behind Loewensteinʼs understanding for the diversity of identities (in Central Europe mainly ethnic and national) and their coexistence, as well as his sensitivity to historical location and conditionality of individuals. According to Havelka, Loewenstein was representing a viewpoint (fairly rare in the Czech environment) which regarded “spiritual sciences” as sciences on creations of the collective and individual human spirit, focusing also on historical forms and influences of these creations, no matter whether his research topic was Fascism, “Bonapartism”, civic society, development and progress, or, more generally, history of ideas. The author points at Loewensteinʼs skepticism toward constructions of great theories and his pronounced terminological nominalism refusing to grant essential validity to collective entities such as nations and cultures. This is related to Loewensteinʼs conviction about the openness of history, both to the past and to the future, toward potential alternative interpretations. The historical pessimism is counterbalanced by Loewensteinʼs complementary perception of historical processes of disciplination and emancipation, or the formation of order and human freedom, although he was also a historian of nationalism, violence, and mass manipulation. The author pays special attention to Loewensteinʼs concepts of modernity, civilization, and mainly belief in progress, which is viewed in his works in diverse manifestations of its ambiguity. In the end, Havelka emphasizes Loewensteinʼs Europeism as a perspective of his historical view and as an integrating civilization principle which is associated with trust in intellect as a means of understanding, tolerance, and consensus. Suk, Jiří and Kristina Andělová (eds. ): „Jednoho dne se v našem zelináři cosi vzbouří“: Eseje o „Moci bezmocných“. Prague: Institute for Contemporary History of the Academy of Sciences of the Czech Republic, v. v. i., 2016, 309 pp., ISBN 978-80-7285-200-0. A review of a collection in which thirty authors and authoresses are contemplating and pondering of Václav Havelʼs famous essay “The Power of the Powerless” forty years since its samizdat edition (1978) was first published in German in the Munich-based Bohemia journal, Vol. 57, No. 1 (2017), p. 250 n. The reviewer states that The Power of the Powerless has so far been translated into twenty-two languages and in many authoritarian regimes it is perceived as highly topical. He points at certain continuities in Havelʼs thoughts about politics, appreciates the diverse character of the texts written for the collection, and presents some authorsʼ views on Havelʼs essay. In his opinion, the collection is an important contribution to the understanding of the period of late Socialism, and also presents evidence of Havelʼs thinking as a continuous source of inspiration. The study stems from the authorʼs long-time interest in the history of the Czechoslovak foreign resistance during the Great War, particularly in Russia. As to its sources, it draws from a collection of published recollections of Czechoslovak legionnaires and their autobiographic novels and other texts of prose. The author attempts to reconstruct the picture of the return of Czechoslovak legions from Russia to their home country; due to the nature of his sources, however, his intention is not to convey an authentic experience of the return in the first days and weeks, but rather to examine the construct created by the legionnairesʼ memories and novels. In this respect, he makes use of, in particular, Anglo-Saxon historical literature dealing with similar topics. The key issues include how individuals or whole social groups were coping with the reality of the newborn republic, which was rather different from the visions of the home country they had been dreaming about while away. An important factor affecting their reflections was also the required political non-affiliation of organizations of legionnaires, as well as the criticism of the situation not just among the veterans, but in the entire society. The extent of the idealization of Russia, which was a fairly frequent phenomenon among them, was directly proportional to the disillusionment after their return, and was a mirror image of their previous idealization of home while they had been in Russia. In the authorʼs opinion, the topic of the return of Czechoslovak legions home and their life in their home country is far from exhausted; this is why the present study should be just a springboard to further broadly conceived research. The study monitors the ladiesʼ magazine Zvěstování (Annunciation) before the elections to local governments in June 1919, which were important not only because they were the first elections in the newborn Czechoslovak Republic, but also as the first occasion during which women could exercise their newly gained right to vote. The Agrarian Party started publishing the Annunciation weekly in January 1919 as a campaigning and educational tool the purpose of which was, first and foremost, to make country women involved in politics, strengthen their loyalty to the party and, in particular, to motivate them to join the agrarian womenʼs movement which was being formed at that time. The authoress focuses on how the movement was articulating its ideas about political and civic activities and interests of women, The resulting picture has a number of features which are the same as or similar to the general period ideal of a female politician as a woman working for the benefit of all, focuses mainly on social issues related to women and children, cultivates the society and politics, and contributes a specifically female element to them. However, the picture is supplemented by an openly declared intention to work on a practical improvement of lives of country women, and open criticism of the behavior of country men to women, not just in the public sphere, but mainly in the marriage and family. The criticism of the patriarchal marriage model is accompanied by articulated awareness of the interlinking of the public and private spheres. The magazine heralds the future evolution of the feminist movement of country women the core of which in the years to come was the Czechoslovak Branch for Interests of Country Women under the umbrella of the Agrarian Party. In the magazineʼs optics, however, the loyalty of female voters of the Agrarian Party was based primarily on their identification with the country, economic motivations, and worries about the collapse of the social order which the Social Democrats were perceived to be able to bring about. The defense of women rights was perceived as a matter and responsibility of women themselves, to whom the party was supposed to provide an organizational framework for this purpose. The authors offer a picture of the 1960s (and partly also the 1970s) as a period heading for a renaissance of rational economic thinking in the Czech Lands, pointing at certain links to economic discussions of the 1990s. The work is a specialized study on the history of economic thinking, but its character is partly that of remembrance as well. It focuses on two outstanding representatives of the Institute of Economics of the Czechoslovak Academy of Sciences in the 1960s, Ota Šik (1919–2004) and Josef Goldmann (1912–1984), and their research teams. As to collaborators of the Instituteʼs director (and Deputy Prime minister in 1968) Ota Šik, who were officially tasked with the preparation of economic reforms at that time, the authors mention contributions of Karel Kouba, Čestmír Kožušník, Bohumil Komenda and Otakar Turek. In 1965, Josef Goldmann established a department of prosperity and economic growth research, which was staffed by many young economists, including the authors of the present study. The latter present an analysis of three directions of Goldmannʼs research: a theory of medium-term fluctuations in the growth rate of central planning economic systems; strategy of economic growth; and research of prosperity. They also describe the influence of the theoretical models of socialist economic systems of Włodzimierz Brus (1921–2007) on Šikʼs team, and that of another Polish economist, Michał Kalecki (1899–1970), on Goldmannʼs thinking. As to macroeconomic issues, the study deals with a period theoretical contribution of Václav Klaus (on inflation in centrally planned economies), while microeconomics is represented by works of Lubomír Mlčoch (in particular his study on the theory of the firm). The study also documents a significant generation dimension of the transformation of economic thinking in Czechoslovakia during the 1960s. In the end, the authors formulate a legacy of the Prague Spring in 1968 in the area of economic thinking. Fifty years ago, the Czechoslovak economics tried to overcome the simplified ideological notion of the centrally planned economy, to better understand the behavior of economic entities, and to use the knowledge to draft an economic reform. Today, we have not yet come to terms with the shift from the principle (ideology) of a “market without attributes” and with the critical analysis of the real operation of the public sector within todayʼs economy, with a high level of redistribution which is often a long way from market principles. Just like in 1968, the gist of the matter is to better understand the “games” played by various economic subjects and institutions, and hence potential dysfunctions of the entire socio-economic system. The article is devoted to a US conference and oral history project organized by the University of South Carolina in Columbia in 1969 under the title “Half a Century of Communist Cadre Training”. Its aim was to obtain testimonies of former graduates of different types of education centers of Communist parties and to use the information for a better understanding of the transnational phenomenon of Communist “cadre” training and its importance for the dissemination of the Communist ideology. The authoress introduces individuals involved in or associated with the project – academic experts and ex-Communists/contemporary witnesses – their public actions and literary works. She uses several selected example to attempt to show how the formation of the Communist activists and their subsequent missions were affecting the evolution and development of Communist movements in their respective countries. She thematizes the projectʼs position in the context of the development of the US Soviet studies and its role from the viewpoint of period socio-political reflections of the Cold War, including predictions of its future development. The article is primarily based on collections of the Hoover Institution Archives in Stanford, California, the core of which consists of unpublished academic and contemporary witnessesʼ essays produced under the aegis of the project. In his interpretatively conceived essay, the author attempts to elaborate on existing studies of the Communist notion of time, using Czechoslovak, East German, and Polish source to examine how the Communist concept of time changed during the period of de-Stalinization. In doing so, he assumes that the critical year of 1956 cannot be viewed only as the beginning of the downfall of the Communist system, but also as the birth of a new epoch with its own specific concept of time. The settling of accounts with Stalinism started by Nikita Khrushchev shook the concept of “iron laws of historical evolution” and strengthened the notion of randomness and irregularity of history. This in turn reinforced the authenticity of various historical players who no longer had to act in accordance with the “great history”. In his analysis, the author distinguishes between two levels of Communist language: binding ideological texts and statements of leaders, as well as texts of party propaganda and historiography, and their modifications in the everyday ideological language practiced, in particular, at meetings of regional, district, and company-level part organizations. Using this material, the author presents several hypotheses concerning the notion of “post-Stalinism”, to be used as a potential starting point of new thinking about the continuity and turning points in the history of Communism. The first of them is a disintegration of the notion of linear time and a strengthening of cyclic elements, which the author calls a “hybridization of time”. The second one is a restitution of the “authentic party” by a revitalization of local memory concentrated on everyday life, as represented by systematically captured memories of pre-war party members. The second hypothesis is related to the third one, namely that of the production and dissemination of nostalgic images of pre-Stalin Communist parties as an alleged original homeland of genuine comradeship. The last hypothesis of the author concerns a deceleration of history and a blurring of the notion of revolution during the post-Stalinism period. Post-Stalinism as a (non)Stalinist project of modernity? The author deals with potential approaches to the conceptualization of post-Stalinism as a specific mental formation gradually born at the turn of the 1950s and 1960s as a result of the crisis of Stalinism. In doing so, he is in opposition to approaches perceiving the period after Stalinʼs death as a mere de-Stalinization, or as a transition period between Stalinism and the so-called normalization in Czechoslovakia. He chose the modernity, or modernization, theory concept of German sociologist Peter Wagner and a reinterpretation of the work of Marx (or Marxism as such) by American philosopher Moishe Postone as his methodological starting points, and he introduces both of them in detail in his study. It is through this optics and dissociating himself from the theory of totalitarianism that he interprets Stalinism as a project of accelerated modernization the efficiency of which was ensured by a centralist bureaucratic system, including its authoritarian features, better than a market economy would have done. He also attempts to infer that Stalinism was a specific evolution of thoughts of Marx and Lenin in given historical circumstances. After the 2nd World War, it was paradigmatically applied in other countries without taking into account their regional specifics, or the previous history and existing level of modernization; during the 1950s, its potential was ultimately spent. In the end, the author tries to view intellectual reform discourses in Czechoslovakia in the 1960s as a distinctive attempt to restart a specific version of socialist modernity. In doing so, he focuses on issues related to the notions of revolution, history, and market, and formulates some hypotheses and topics for discussion. Kolář, Pavel and Michal Pullmann: Co byla normalizace: Studie o pozdním socialismu. Prague: Lidové noviny Publishing House and Institute for the Study of Totalitarian Regimes, 2016, 222 pp., ISBN 978-80-7422-560-4. 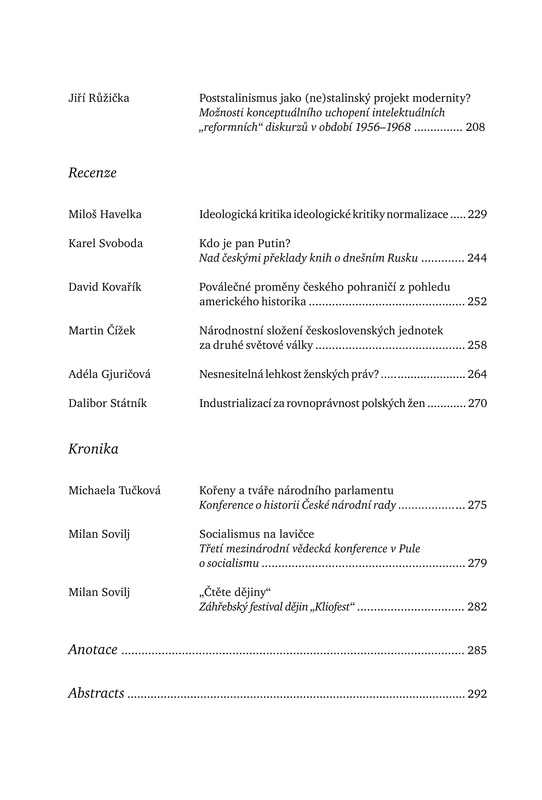 In the reviewerʼs opinion, the collection of essays is one of the most significant publications that have so far been written about the so-called Czechoslovak normalization period (1970–1989), the fact that their primary motivation was to problematize and critically thematize the bias of past and existing approaches to the period, and in fact to the whole era of Czechoslovak Communism (1948–1989) notwithstanding. His extensive review points at problematic aspects of the “revisionist” interpretation of the authors, and polemicizes with some of their concepts and ideas. In his opinion, the basis of their criticism is vague, partly politically motivated and leaning to the left, and he also claims that justified requirements of taking a historical view on the Czechoslovak “normalization” stop short of an analysis of specific phenomena. He questions their schematic rejection of the concept of totalitarianism or, given the topic, the adequacy of their terms “late socialism”, “dictatorship”, or “everydayness” used as interpretation frameworks or analytical tools. He polemicizes with the authorsʼ interpretation of the Prague Spring in 1968 and Max Weberʼs concept of power legitimacy, especially in connection with the use of violence during the “normalization”. In the end, the reviewer concludes that the authors offer a not very convincing, ideological antithesis to existing theses on the time of the Czechoslovak “normalization”, which means that we will still have to wait for a true historical synthesis. Zygar, Mikhail Viktorovich: Všichni muži Kremlu: Stručná historie současného Ruska. Translated from Russian by Libor Dvořák. Příbram: Pistorius & Olšanská, 2016, 413 pp., ISBN 978-80-87855-64-5; Gessen, Masha: Muž bez tváře: Neuvěřitelný vzestup Vladimira Putina. Translated from English by Marek Sečkař. Prague: Akropolis, 2016, 401 pp., ISBN 978-80-7470-126-9; Kasparov, Garri Kimovich: Zima přichází: Proč je nutné zastavit Vladimira Putina. Translated from English by Petr Kovařík. Brno: Jota, 2016, 302 pp., ISBN 978-80-7462-988-4; Laqueur, Walter: Putin a putinismus: Rusko a perspektivy jeho soužití se Západem. Translated from English by Petruška Šustrová. Prague: Prostor, 2016, 383 pp., ISBN 978-80-7260-329-9; Pomerantsev, Peter: Nic není pravda, všechno je možné. Translated from English by Martin Weiss. Prague: Dokořán, 2016, 259 pp., ISBN 978-80-7363-704-0. The reviewer presents and compares five books on Russiaʼs president Vladimir Putin and the political regime in todayʼs Russia which have been published in Czech. Three of them were written by journalists (Gessen, Pomerantsev, Zygar), one was written by a renowned historian (Laqueur), and the last one by an active politician and chess grandmaster (Kasparov). All are very critical toward the current Russian regime, but they differ in the extent of personal experience with it and in their focus on different aspects of the topic: Putinʼs personality and journey to power (Gessen), power establishment and ruling mechanisms in the Kremlin (Zygar), ideological sources of Putinʼs regime and current Russian nationalism (Laqueur), methods of persecuting political opponents and attitudes of the West to Russia (Kasparov), or media propaganda of the Kremlin and creation of a false image of reality in the society (Pomerantsev). It is the diversity of their view on todayʼs Russia, the capturing of various aspects of its political reality, and efforts to penetrate under the surface the reviewer sees the greatest merit of the abovementioned books in. Original titles of the reviewed publications: Zygar, Mikhail V.: Vsya kremelskaya rať: Kratkaya istoriya sovremennoy Rossii. Moscow: Intellektualnaya literature, 2016; Gessen, Masha: The Man Without a Face: The Unlikely Rise of Vladimir Putin. New York: Blue Riverhead Books, 2012; Kasparov, Garri: Winter is Coming: Why Vladimir Putin and the Enemies of the Free World Must Be Stopped. London and New York: Atlantic Books and Public Affairs, 2015; Laqueur, Walter: Putinism: Russia and Its Future with the West. New York: Thomas Dunne Books, 2015; Pomerantsev, Peter: Nothing is True and Everything is Possible: The Surreal Heart of the New Russia. New York: Public Affairs, 2014. Glassheim, Eagle: Cleansing the Czechoslovak Borderlands: Migration, Environment, and Health in the Former Sudetenland. Pittsburgh: University of Pittsburgh Press, 2016, 288 pp., ISBN 978-80-8229-6426-1. The author focuses on three areas of issues. The first of them is the post-war cleansing of the Czechoslovak borderlands, related to the unfulfilled efforts of Czechoslovak authorities for an ethnic homogenization of the regions. The second one comprises changes of the borderlands and their use as a “laboratory of state socialism” in the process of modernization transformations. The third area concerns memories of home and the formation of a new identity of expelled Germans and new settlers arriving to the border regions. In the reviewerʼs opinion, the uniqueness of the book stems from conceptual and methodological approaches by means of which Glassheim describes the development of the Czechoslovak borderlands and living conditions of local people from a viewpoint of an environmental historian rather than in the topic of the publication. He emphasizes the role of economic and social factors related to the economic policy of the state, since the end of the war oriented mainly on the exploitation of mineral resources and heavy industry as tools used to promote the technocratic, production-driven vision of modernity. However, its implementation not only resulted in the devastation of the borderlands and their environment, but also had an adverse effect on the local population, particularly on their social relations and health. Maršálek, Zdenko: „Česká“, nebo „československá“ armáda? Národnostní složení československých vojenských jednotek v zahraničí v letech 1939–1945. Prague: Academia, 2017, 528 pp., ISBN 978-80-200-2608-8. The author examines in detail the ethnic structure of Czechoslovak units which were formed in France, Great Britain, Soviet Union, North Africa and Middle East during the 2nd World War. His work is based mainly on a statistical analysis of an extensive set of data stored in the complete electronic database of soldiers of the Czechoslovak foreign army of the Central Military Archives – Military History Institute in Prague. The reviewer describes the numerical methods used, including their benefits and limitations, and presents the authorʼs conclusions and hypotheses. In his opinion, the most significant finding of the book is that concerning the diversity of the Czechoslovak units abroad; compared to other exile armies, the Czechoslovak Armyʼs ethnic structure was by far the most diverse one. The diversity of and percentages of different nationalities in the units depended on the place where they were formed and the time of their formation. The unbearable lightness of womenʼs rights? Wagnerová, Alena: Žena za socialismu: Československo 1945–1974 a reflexe vývoje před rokem 1989 a po něm. Gender sondy, Vol. 12. Translated from Germany by the authoress. Prague: Sociologické nakladatelství, 2017, 262 pp., ISBN 978-80-7419-252-4. The publication is a Czech translation of Alena Wagnerʼs book Die Frau im Sozialismus: Beispiel ČSSR (Hamburg: Hoffmann & Campe, 1974) which was originally published in German, supplemented by several later essays dealing with the situation of women and womenʼs movements in Czechoslovakia (Czech Republic) and the Federal Republic of Germany. The Czech writer and cultural historian explains her motivation to write the book by a sharp contrast between the emancipated status of women in Czechoslovakia and the traditional patriarchal model she encountered after her arrival to West Germany in the early 1970s. Based on results of previous sociological surveys, she used the example of Czechoslovakia to describe the model of socialist emancipation characterized by a high level of employment of women and their full equality under the law. The reviewer believes the forty years old study of Alena Wagner is very remarkable, primarily because the authoress analyzes gender issues (without actually using the term “gender”) against a specific historical background, an aspect that is often absent in todayʼs works in the field of gender studies; she also foresees findings of later sociological analyses, and weighs pros and cons of the emancipation model she analyzes. Fidelis, Małgorzata: Kobiety, komunizm i industrializacja w powojennej Polsce. Translated from English by Maria Jaszurowska. Warszawa: Wydawnictwo W. A. B., 2015, 366 pp., ISBN 978-83-280-1532-6. The book by the Professor of the Illinois University in Chicago was originally published in English under the title Women, Communism, and Industrialization in Postwar Poland (Cambridge: Cambridge University Press, 2010) and deals with the journey toward womenʼs emancipation in post-war Poland in the context of the socio-economic development in the country. She focuses on the process of socialist industrialization, which involved mass employment of particularly country women in industrial enterprises, including mines and heavy industry factories. However, the independence and new lifestyle of young female workers were also causing moral criticism, which was combined with a rejection of the previous policy in the process of de-Stalinization after 1956. As a result, women were forced out to more traditional and less paid professions. According to the reviewer, the authoress not only offers new information, partly based on oral history, but places it into an appropriate context and presents it in an unconventional manner. At the same time, she does not provide an a priori assessment of the efforts to radically resolve the womenʼs issue in Poland before 1956, but attempts to understand them in a comprehensive manner and provide their historical interpretation. The scientific conference named “Czech National Council: Roots and faces of the national parliament” and commemorating the fiftieth anniversary of the establishment of the Czech National Council, which was organized by the Office of the House of Deputies of the Parliament of the Czech Republic together with the Institute for Contemporary History of the Academy of Sciences of the Czech Republic, took place on May 17 and 18, 2018, on the premises of the House of Deputies in Pragueʼs Sněmovní Street. The report describes the contents of presentations delivered by historians and contemporary witnesses (including ex-politicians) and their discussion. Personal recollections thus made a useful contribution to the research of historians focused not only on the establishment of the Czech National Council and the work of the deputies in 1968 and 1969, but also on the so-called normalization and the period after 1989, thus providing an insight into the complex mechanism of the professional support structure of the institution at different times. On September 28 to 30, 2017, the Center for Culturological and Historical Studies of Socialism of the Juraj Dobrila University in Pula, Croatia (Centar za kulturoloshka i povijesna istrazhivanja socijalizma, Sveuchilishte Jurja Dobrile u Puli), organized the third international conference dedicated to research of socialism under the title “Socialism on the Bench: Communists and Communist Parties. Policies, Actions, Debates”) (Socijalizam na klupi: Komunisti i komunističke partije: politike, akcije, debate). The report presents the organizing institution and the eventʼs content, characterizing the conference as a very successful meeting of more than a hundred historians and specialists in other social sciences, mainly from countries of former Yugoslavia, on diverse aspects and issues of the history of (not only) Yugoslaviaʼs socialism. The report describes a unique (at least in the Croatian context) event named “Kliofest” which takes place in Zagreb and comprises a number of historical lectures, discussions, exhibitions, and book presentations. The event was held for the fifth time on May 8 to 11, 2018, and was jointly organized by thirteen different scientific institutions and associations led by Professor Damir Agičić of the Faculty of Arts of the Zagreb University. This yearʼs event was a reminder of anniversaries ending with an “8” and related to Croatia, the territory of former Yugoslavia, and also to some European and global events. The Czech Republic was represented by a fairly numerous group of historians, but the professional dialogue over the common past would have benefited from a higher number of colleagues from other countries of former Yugoslavia.